Welcome to our White Tea offering. Tea is often compared to coffee, but we believe tea is actually more akin to wine with its extensiveness in flavor, aroma, and potency. This variety has the most delicate and subtle flavor profile of all of the varieties in this family of leaves. In most cases, the leaves are picked when the plant is young and there is minimal processing of the leaves. The history is somewhat of a mystery. According to some legends, this type was reserved for the Emperor’s consumption. On the scale of light to dark, White Tea is most often lighter than Green Tea. To fully appreciate the delicate nuances of this tea, we recommend mindfully sipping and savoring the moment. Given life is so hectic, this provides a much needed respite. We have chosen and presented to you White Tea with clean palates and subtle undertones, from renowned experts in regions that specialize in growing this type of tea. Because of the simplicity in processing this tea, superb White Tea depends on the proper combination of altitude, soil composition, and weather conditions. While this could be said for all unblended teas, it particularly holds true for this type. Our collection of White Tea is curated by the owners of Tea Vue. 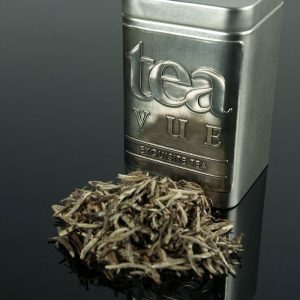 View Cart “Silver Needle White Loose Leaf Tea” has been added to your cart. How should White Tea be paired? Being the lightest of all teas in this class of plant, it can accompany food as do the mildest white wines. This brew will inevitably be overpowered if imbalanced with pungent cuisine. Lighter fare such as steamed vegetables, tofu, cucumber salads, and mildly flavored fish are excellent choices. Albeit extravagant, we find it pairs quite nicely with caviar as the brew’s flavor is clean and mild.